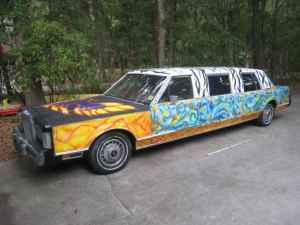 Beaterblog: T-Topz' Limo is For Sale and on Jalopnik! Friend of Beaterblog, T-Topz bought this car about five years ago in it's pure velour on white condition. I can't describe it's current form better than T-Topz' brother, Mini-Topz. Here it is, now featured on Jalopnik and for sale here! I've had many-a-ride to and from the bar in the thing...Crack Pipe! I won't forget when we were driving to Busy Bee's with no defroster and the wipers had fallen off on Max's trip to PCB. Mini-topz was freaking out because he couldn't see but no one else cared at all!